Published: Dec. 4, 2018 at 12:41 a.m.
Washington Redskins running back Adrian Peterson rushes for a 90-yard touchdown. 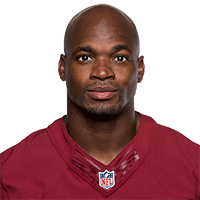 Published: Nov. 18, 2018 at 03:39 p.m.
Washington Redskins running back Adrian Peterson passes John Riggins on NFL's All-Time TD rushing list. Washington Redskins running back Adrian Peterson bends run outside for 3-yard touchdown. Published: Oct. 28, 2018 at 06:24 p.m.
Washington Redskins running back Adrian Peterson zips down the sidelines for a 64-yard touchdown.